Feel free to contact us for additional information or to reserve your space today! If your travels are taking you to or through Cheyenne, Wyoming then you're in for a nice surprise! "The Magic City of the Plains" is located at the crossroads of Interstates I-25 and I-80 and an anchor in the growing economy of the Front Range of the Rockies. It is home to the Wyoming State Capitol, F.E. Warren Air Force Base, Cheyenne Frontier Days™ and Laramie County Community College. Whether you're visiting for a week, an hour or making Cheyenne your home, there is always something to do. Our fine city maintains the charm of the Old West, while still offering all the amenities of a modern city. With a wide selection of fantastic restaurants, shopping opportunities, museums, art galleries, theaters and parks, rest assured you will enjoy your visit and create a memory or two. The staff at Trader's Media hopes you appreciate Cheyenne and find our online Visitor's Guide helpful. For your convenience, the circled numbers in the advertisements in this guide correspond to our map and business locator on pages 68 & 69. Welcome to Cheyenne. Have a wonderful stay! 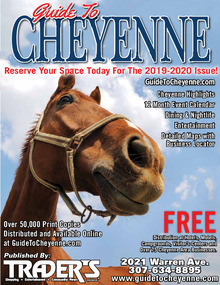 Copyright ©2019 Guide To Cheyenne. All Rights Reserved.